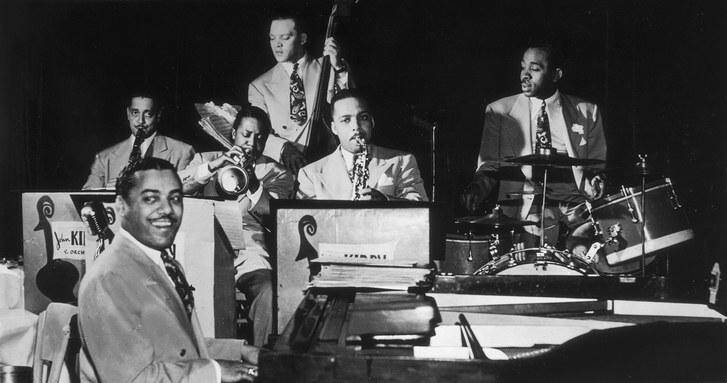 John Kirby, in back center, with Billy Kyle, on piano; Buster Bailey, on clarinet; Charlie Shavers, on trumpet; Russell Procope, on alto saxophone; and O’Neil Spencer, on drums. He was probably the only bassist during the Swing era to lead a successful band. John Kirby was not a major soloist on the level of Jimmie Blanton but he had a concept. He envisioned a cool-toned three-horn sextet that could perform complex arrangements with ease, often paying tribute to classical music while being quite capable of playing uptempo blues and swing standards, but in their own way. His dream came true, at least for a few years.